Welcome to the Affiliate Center for WorkingPerson.com. Here you can reference the program’s terms and stay up on important updates. 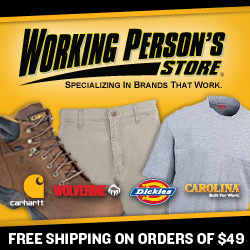 WorkingPerson.com is the web’s leading workwear retailer. Dedicated to the working person, they offer top workwear and footwear brands such as Carhartt, Dickies, Timberland and Wolverine at the lowest possible prices. WorkingPerson.com serves a wide array of customers on both a national and international basis, with an ever increasing demand for our goods and services. They have an average order of more than $100 and a conversion rate that is above average. 1. FREE SHIPPING on orders over $49! 2. FREE Returns when exchanging products. 3. 120% Price Match Guaranteed!